Located on the north side of 43rd Ave.between Vernon Blvd. and Ninth Street. Look for a sign 'Plant Specialists, Inc.' Walk or drive inside the courtyard and the office is immediately on the left. Within minutes of Manhattan, and conveniently close to the Queensborough Bridge, Mid-town Tunnel, Tri-Borough Bridge, LIE, BQE, Grand Central Pkwy and La Guardia Airport. Enter the bridge by turning LEFT from Second Ave (1 way south) between 59th & 60th Streets. OR, turn LEFT onto 59th Street from First Ave (1 way north) and after 1/2 block turn RIGHT onto ramp to bridge. Stay in right lane when exiting off the bridge in Long Island City, and make the first possible RIGHT which is 27th Street. Proceed 2 blocks and make a RIGHT onto 43rd Ave. Proceed straight (towards Manhattan) on 43rd Ave. for 10 1/2 blocks. Du Val Enterprises (look for Plant Specialists, Inc. sign) is on the right side, middle of the block, between 9th St. and Vernon Blvd. Enter the bridge by going north off 57th or 58th Sts between First and Second Aves. Follow signs to "21st Street" (bearing right at fork and proceed in left lane to traffic light at bottom of the ramp. Make a LEFT onto 21st St. Proceed 1/2 block to the first intersection /traffic light and make a RIGHT onto 43rd Ave. Proceed straight (west towards Manhattan) on 43rd Ave. for 5 1/2 blocks. Du Val Enterprises (look for Plant Specialists, Inc. sign) is on the right side, middle of the block, between 9th St. and Vernon Blvd. From Manhattan to Queens Stay in right lanes through toll booths in Long Island City. Immediately after toll booths make a hard RIGHT (180 degree turn) onto Borden Ave. You will now be facing west, back toward Manhattan. Take the first RIGHT - onto Vernon Blvd. Continue straight (north) on Vernon Blvd. for 15 blocks. Make a RIGHT onto 43rd Ave. Du Val Enterprises (look for Plant Specialists, Inc. sign) is on the left side, middle of the block, between Vernon Blvd. and 9th St.
Take the Brooklyn Queens Expressway north and EXIT at McGuinness- Humboldt. Make a LEFT at the end of the exit ramp and go under the BQE onto McGuinness. Continue straight (north) about 20 blocks, then go over the Pulaski Bridge and then straight across Jackson Ave. Continue straight (north) on 11th St. about 11 blocks and make a LEFT onto 43rd Ave. Proceed straight (west toward Manhattan) for 2 1/2 blocks. Du Val Enterprises (look for Plant Specialists, Inc. sign) is on the right side, middle of the block, between 9th St. and Vernon Blvd. Go WEST towards Manhattan and EXIT at Van Dam Replica rolex(last exit before the Midtown Tunnel to Manhattan). Proceed straight across first intersection with the stop light. Stay on the street along the right side of the supports of the LIE. In 5 blocks the street will cross under the LIE to the south side and become Borden Ave. Proceed straight (west) on Borden Ave. 6 blocks, just past the Midtown Tunnel (on your right) and then make a RIGHT turn onto Vernon Blvd. Proceed straight fake omega (north) on Vernon Blvd. for 15 blocks. Make a RIGHT onto 43rd Ave. Du Val Enterprises (look for Plant Specialists, Inc. sign) is on the left side, middle of the block, between Vernon Blvd. and 9th St.
Take the Triborough Bridge to Queens, staying in the right lane. As you are coming off the bridge, take the FIRST EXIT, making a hard RIGHT across the side road along side the bridge (Hoyt Ave. So) onto 29th Street. Go 1 block and make a RIGHT onto Astoria Blvd. Proceed 5 blocks and make a LEFT onto 21st St. Proceed straight (south) 20 blocks and go under the Queensboro / 59th Street Bridge supports. Then take the second right onto 43rd Ave. Proceed straight (west towards Manhattan) on 43rd Ave. for 5 1/2 blocks. Du Val Enterprises (look for Plant Specialists, Inc. sign) is on the right side, fake tag heuer middle of the block, between 9th St. and Vernon Blvd. From Manhattan to Queens, "23rd & Ely" stop. Stay on the back end of the train and you'll exit fake Panerai watches onto 21st St. On the front of the train you'll come out on 23rd St. and 45th Ave. Back end of the train is best. Go north on 21st Street towards the Queensborough / 59th St. Bridge for 3 blocks. Make a LEFT onto Ninth St. Walk one block to 43rd Ave. and make a RIGHT. Du Val Enterprises (look for Plant Specialists, Inc. sign) is on the right side, middle of the block, between 9th St. and Vernon Blvd. From Manhattan to Queens, "Queensplaza" stop. Exit to Queens Plaza South. Walk 12 blocks west, toward Manhattan (parallel to the Queensborough / 59th Street Bridge). Make a LEFT onto Ninth St. Walk one block to 43rd Ave. and make a RIGHT. Du Val Enterprises (look for Plant Specialists, Inc. sign) is on the fake Panerai watches right side, middle of the block, between 9th St. and Vernon Blvd. From Manhattan to Queens, "Queensboro Plaza" stop. Exit to Queens Plaza South, via the pedestrian walkway over the street. Walk 9 blocks west, toward Manhattan (parallel to the Queensborough / 59th Street Bridge).Replica tag heuer watches Make a LEFT onto Ninth St. Walk one block to 43rd Ave. and make a RIGHT. 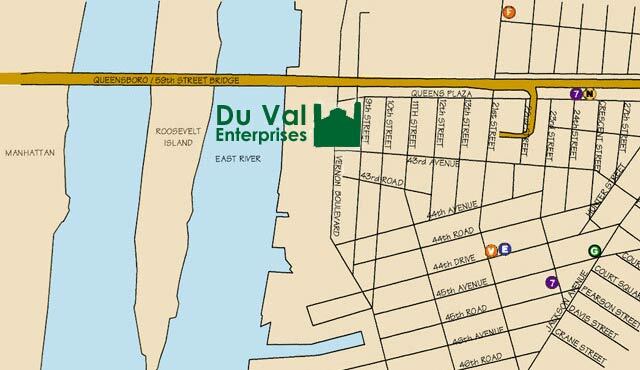 Du Val Enterprises (look for Plant Specialists, Inc. sign) is on the right side, middle of the block, between 9th St. and Vernon Blvd. From Manhattan to Queens, "21st Street, Queensbridge" stop (1st stop in Queens). Walk south on 21st St. 2 blocks under the Queensborough Bridge supports. Turn RIGHT onto 43rd Ave. Walk 5 1/2 blocks. Du Val Enterprises (look for Plant Specialists, Inc. sign) is on the right side, middle of fake omega watches the block, between 9th St. and Vernon Blvd.